I reported the cars on arlington and josephine when I was walking on the sidewaqlk between an SUV and a fence, and someone had to walk around the car on the street side. 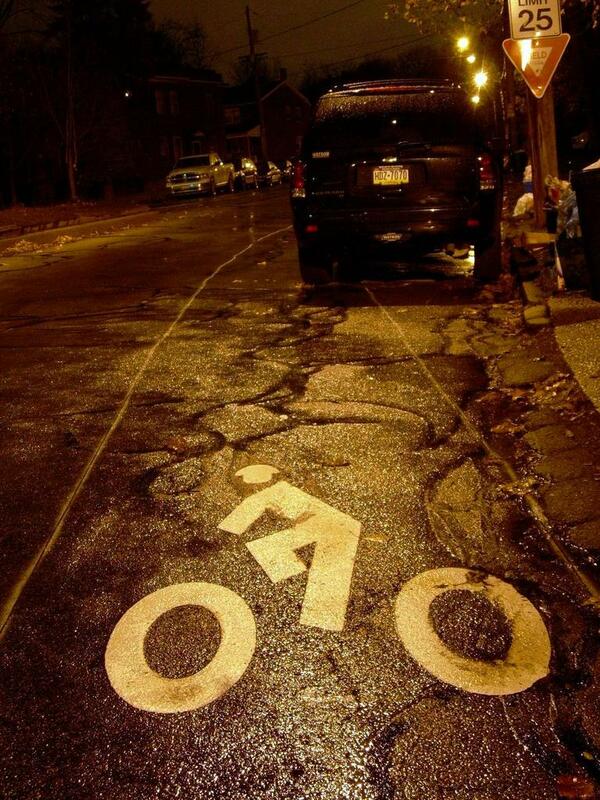 In case anyone else has run into this: I just submitted a request to have the bike lanes on S. Millvale Ave swept. As of 9:00 last night, lanes in both directions were littered with either shattered glass or plastic – either way, it looked unfriendly to tires. Cars started to creep back on the sidewalk on Greenfield Ave as of last night. Whatever the fine is, it doesn’t seem to be enough to deter people after having received a ticket or two. IIRC blocking a sidewalk with a car is $15. I believe blocked sidewalks are an ADA violation. A civil suit for that could cost a bit more than $15. Someone should put together a nice ticket-sized pamphlet explaining such, and tuck them under the wiper blades of the scofflaws. I would take many of them and tuck them under the wipers on my way up arlington/down josephine. Message: The end of Putnam Street, just before it dead ends into Social Way has two dangerous spots: a large gaping hole adjacent to a fire extinguisher. The hole appears to be a failing sewer pipe and is large enough for a bicyclist or pedestrian to fall into. There is also a large, impassable puddle across the entire road with potholes at the bottom. This area is poorly lit at night and is a popular path between shadyside and bakery square/mellon park for pedestrians, bicyclists, and park users. Very dangerous. I commute by bicycle daily from Squirrel Hill to Bakery Square via Social Way, making a right onto Putnam St. Several of my co-workers also use this route by bicycle and on foot. A month or so ago, a very large hole opened up in the street near the fire hydrant. The hole is several feet wide and deep and someone could easily fall into it and be injured. Although the street is closed to traffic, I assume it is still a valid pedestrian route and should be maintained. It is a vital link between Shadyside and East Liberty. This hole was reported yesterday, and the appropriate personnel has been notified. We appreciate your patience in this matter. Thank you for contacting our 311 Response Center. Message:	This afternoon, as I was biking across the upstream side of the Smithfield Street Bridge pedestrian walkway, I observed 1″ to 3″ wide holes in the decking. There is significant corrosion at nearly ever butted joint between the steel deck pans. The joints have corroded, broken through the wearing surface and are exposed to the elements. This is at least a tripping hazard and at worst a not so subtle preamble to eminent collapse of a walkway section. Please Fix. Happy Holidays. I’ve been meaning to report that for weeks. I got a response to a recent 311 that included a link to an online tracking system. It isn’t linked from the normal 311 form, and I haven’t seen it mentioned here. The coolest thing of it is, they keep track of all 311 submissions from my email address, all in one place. They seem to include the initial response, but any followups after that are not attached to the submission for some reason. Also: slightly creepy, but you might not want to post ID numbers on here anymore, or maybe mask them slightly. That or use an email address people could not easily find online. If you have a Ticket ID number and an email address the person used to submit the ticket, you can view all their tickets and submit replies. Your submission has been assigned a Ticket ID number: 12164.
called in the sidewalks on penn ave this afternoon. Told them about how there’s not enough room between vendors for pedestrian traffic to flow. I stressed that I like the vendors, I’m glad they’re there, but they make it extremely difficult to get to them. they said they’d send building inspectors to investigate that (because that’s what the sidewalks of the business district fall under). I said, “It may be hell to do so, but see if they can’t go on a saturday – that’s when the real problems occur. I pointed out two in particular that I had trouble with today as well. There’s a huge puddle that forms at the corner of Forbes at Oakland Avenue, at Joe Mama’s, whenever there’s rain. I submitted it a few weeks back and again now. called to see if someone could plow the parts of spring way in the strip that have a few inches of snow on it. They said they’d send someone out, since the plows were still roaming around. “Approximately one month ago, bike lanes were installed on Wilkins Avenue. I specifically want to comment on the intersection of Dallas and Wilkins where the road significantly narrows at the turn. I do not ride this route on my bicycle every day but on every day that I have in the past month, both early in the morning and in the evening, a vehicle has been parked in the bike lane. It is a dark Chevy Trailblazer LT, with PA plate HDZ-7070, I would guess parked in front of his own home rather than in the driveway. Because of the alignment of the bike lane and the place where this vehicle parks, the bike lane is squeezed to approximately half it’s width. As cars and buses typically come around that corner with little diminishment in speed, it is very dangerous for any cyclist attempting to use this bike lane as there is no room for all three vehicles. In any conflict for space, the cyclist will loose. Perhaps catastrophically so. Kordite – is that on the inbound or outbound side of Wilkins? I believe what he’s talking about is our steiner with broom, it is used for snow removal, clearing the sidewalk. If it is used on the bike lane all I will be doing is pushing is from one place to another. Please clean debris from bike lanes in Schenley Park. @ejwme That’s on the inbound side. iloveclones – unlike God, the city of pittsburgh is accountable to the good citizens of pittsburgh. you’re right that snow removal is just pushing snow from one place to another – this person has just decided that it’s not worth it. Seems as though additional 311 complaints are required to recallibrate him/her. kordite – thank you! I thought the lane just dissappeared there, I didn’t realize that it went under the parked cars. During street sweeping season, the bike lane on Greenfield is kept surprisingly clear. I don’t know how often they come through, but crap doesn’t hang around for more than one day, usually. Now that sweeping season has ended, there is a good bit of leaf litter and other rubbish in the lane. Not sure if the plow-brush thing would be able to remove that stuff or not. I know when they brush the sidewalks, the snow is blown off the side. In the bike lane, they would have to brush the snow up a hill. Maybe that is what the guy is talking about? Can their machine actually toss snow, or does it just brush it to the side? Maybe he/she misunderstands and thinks you want him to brush the snow off the edge of the road back onto the sidewalk? “pushing is [sic] from one place to another.” If the sidewalk and bike lane were actually on the same side of the road, this statement would make sense. Brush snow into bike lane, then brush it from the bike lane back to the sidewalk? Biking in conditions like this, I don’t know if I have enough hubris to infer that City of Pgh is more accountable than God…. Me: Would you mind using your wonderful machine to remove the snow from the bike lane? Sweeping Guy: I can’t. There’s debris preventing me. Me: Wellllll, then would you mind removing the debris? Sweeping Guy: Sorry. Call 311. That’s another guy. The debris in the bike lane (also on Forbes Ave bike lane) is actually more of a concern, as you have to go out into traffic to avoid it. And cars tend to cut into that bike lane, either going around the bend, or when left turning traffic stacks up at the top of the hill. I keep hoping this will be the day the bike trails get cleaned – a quick brush would do wonders to make them safer to ride on. Will these be done at all this winter? Please specify which trail needs cleared off. Where is the snow build up that needs removed on the bike trails? I replied that the entire Jail trail and Panther Hollow trail were covered in snow and it appeared they had not been cleaned since it snowed last week. Include Hot Metal Bridge and Southside trail, if they call back. Or you can make your own request- I feel the more people that contact them, the more they think are paying attention and will benenfit by cleaning the trails. I did it by email. just 311’d the snow on the bike lanes on liberty and all over spring way. I tried calling, and their hours for the day were done with, so I tried to leave a message but after it said the leave the message at the tone, it then said “I’m sorry, we are unable to do that” and hung up. I just put in a request to clear the Panther Hollow Trail and the south side sidewalk along Fifth Ave from Birmingham Bridge to Craft. I’m not sure how they are on the other streets, but I know for sure the snow is piling up in these. Please clear the following bike lanes/paths of snow as soon as possible. Lots of folks are commuting by bicycle year round. Please also ask the person who clears the sidewalks around the Parking Garage exit on 2nd avenue not to block the sidewalk leading to the Eliza Furnace Trail with the moved snow. All the snow was pushed into a big heap on the sidewalk near the bike rental place, preventing access to the trail. Thanks for all your hard work: I appreciate the 311 service and being able to use bicycles throughout the city. I would only anticipate bicycle use to go UP as the transit faces more cuts. Thanks again for your attention to this matter. This morning I followed behind a Pittsburgh public works truck down Panther Hollow Rd past Phipps into Oakland. He had a plow and salt spreader. He didn’t do anything until we got to the bridge between the library and Phipps, where he dropped his plow and started spreading salt on the shoulder of the road, where those white hash marks are, and where most people would bike. The driving lane was entirely clear, so it was cool to see they go back over it and clear the sides too. According to @pghtrails twitter feed, Panther Hollow Trail was plowed after our 311 request. It seems to be working. Keep speaking up. @Hyla, let us know how Forbes & Dallas looks today? The inbound bike lane on Forbes has *not been plowed as of noon-ish Saturday. The sidewalk *has been marginally plowed but not salted. Helpful to pedestrians but looked pretty useless for my Vittoria Randonneur tires. I took the lane. I’ll check out Panther Hollow & at least part of Dallas on my way back. These things looked worse than your average pothole, they’re really deep – pretty much as soon as you cross Forbes and start going up the hill. I was in a car when I saw them and there’s at least one on each side so also watch for people swerving to avoid them. Heading North on Wightman, at the start of the 1600 block just North of Forbes, there are 2 or 3 large and very deep potholes. I saw them yesterday (1/23) around 2pm. We have notified the appropriate personnel about this issue. The Service Request ID number associated with this request is xxxx. hit up the middle of market square which was all slick today, but you couldn’t see which parts were going to be. Also sent in reports of the potholes between downtown and the strip on penn, and a torn up sidewalk corner on liberty and 36th. I’m feeling productive. I called in to 311 yesterday to ask the city to fill in the craters where Wightman crosses Forbes. I’ve been down with flu so it was a big disappointment when I got out for the first time in weeks and saw that these potholes haven’t been dealt with yet. The biggest one, being right at the end of the bike path, is downright deadly…so watch yourself. Thanks meaculpa. Let us know when they’re filled in.